The base of the system is the 3 mm thick steel plate (sold separately in various dimensions), which is mounted (glued) onto a wall or any other vertical surface (ceramic tiles,�). A variety of magnetic shelves, hangers and holders are then fastened onto it. 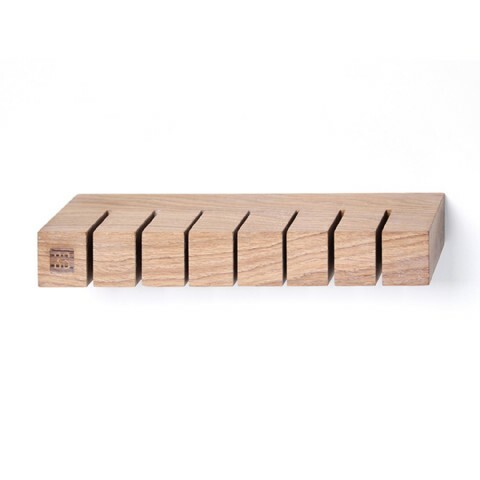 Wooden knife holder has magnets built into the reverse, which fasten the element onto the steel plate. Therefore, you can change its position from one place on the back plate to the other, without using any kind of tools. The knife holder holds up to 7 knives. If you wish to protect the knife-points, you can complement the Knife holder with Shelf U.